Illumina is a San Diego based, publicly traded company (ILMN) that develops, manufactures, and markets its proprietary line of integrated systems to sequence DNA. Illumina has spearheaded the development of third-generation DNA sequencing systems, which allow for massive and fast sequencing of complete genomes, enabling the study of population genomics. In turn, this has opened the door to endless healthcare applications. Incorporated in 1998, Illumina’s first products were in the area of Single Nucleotide Polymorphism (SNP) profiling. The company’s IPO occurred in 2000, while launching its first product. Illumina not only builds systems, it also markets all the consumables it requires. Illumina continues to identify and develop new applications for its sequencing systems. After the turn of the twenty-first century, several companies were developing competing technologies for third-generation sequencing systems. In 2007, Illumina took the lead in the industry through the acquisition of its competitor, Solexa. The acquired company had developed what now constitutes the core technology used in Illumina’s sequencers. This acquisition was a studied tactical move that required the recognition of the competitor’s strengths and, more importantly, Illumina’s own weaknesses. Illumina likely understood how this new technology had the best balance between cost and quality for the de novo production of genomic sequencing data. They also perceived the potential this pipeline had for improvement and optimization and, more importantly, how this potential could be achieved. At Illumina, the push for further development was spearheaded by its own R&D teams. If in 2009 it cost Illumina forty-eight thousand dollars to sequence one human genome, this price tag had fallen almost fifty times by 2014. It was in January of that year that Illumina announced it had broken the barrier of the “one thousand dollar genome” with the introduction of the HiSeq X Ten System. Illumina had lowered the machine cost to about eight-hundred dollars per sequenced genome, taking only five years to do so. To put things in perspective, the first sequenced human genome cost $2.7 billion (in FY 1991 dollars) and took more than 10 years to complete. Illumina has experienced rapid growth and was named to Forbes’s fastest growing technology company list in 2007, 2009, and 2010. Illumina’s stock price was valued at under two dollars per share at its low point in 2003. The company’s sustained growth and solid technological development led to a hostile takeover bid by Roche in 2012. This pushed the stock price to over $50 per share and the overall company valuation to over $6 billion. After Illumina’s management fended off Roche’s takeover, they continued the development of the long-term corporate strategy. Illumina worked to place products in ever-increasing numbers and ranges of institutions worldwide. These include academic and government settings, as well as pharmaceutical, diagnostics, and biotech companies. As much as 80 percent of Illumina’s revenue comes from genotyping. Depending on the year and analyst, Illumina’s market share has been considered to be in the range of 60 to 90 percent. As a reflection of market dominance, in 2014, over 90 percent of all DNA-generated information was produced by existing Illumina systems. Jay Flatley, who was Illumina’s CEO from 1999 until July 2016, grew the company from $1.3 million in sales in 2000, to over $2.2 billion in sales in 2015. The new president and CEO, Francis deSouza, is an insider who has worked at Illumina since he joined as president in 2013. Flatley has stayed on as the executive chairman of the Board of Directors, “focusing on strategy and on expanding the use of DNA sequencing in medicine.” Illumina’s R&D and technical teams also have remained extremely stable assuring the continuation of coherent strategic planning and implementation. Illumina’s technology was initially used and developed for basic and applied research environments. With the advent of the personalized medicine era, the company is creating routes into the clinical diagnostic and medical care markets. It is not that Illumina’s systems and technologies were repurposed from its original research applications. According to interviews with current and former employees, it had always been part of an audacious long-term strategy to reach human health markets. Illumina has become the major engine powering the human genomics diagnostics industry. While smaller systems are used for basic diagnostic purposes, its bigger systems have attracted the attention of “digital medicine” companies that seek to unleash the power of comparative population genomics to build databases. In this area, according to personal interviews, Illumina’s clients for HiSeq X Ten sequencers include Human Longevity, Inc.; WuXi PharmaTech (Cayman) Inc.; Macrogen Corp.; Novogene Bioinformatics Technology Co. Ltd.; HudsonAlpha Institute for Biotechnology; Foundation Medicine, Inc.; and about 20 other companies. These databases will create value by mining useful information for highly coveted areas such as preventive and personalized medicine or new drug development and repurposing. As the powerhouse of this revolution, Illumina has taken an active role in fostering the development and implementation of next generation sequencing (NGS) diagnostics technologies. Illumina has chosen not to remain idle at the top of the value chain as a simple monopolistic developer and purveyor of technology. Instead, it has taken initiative and participates in the development of new markets rather than waiting for the markets to develop by themselves. Illumina has created specific business units using a market-based approach. As a technology and healthcare solutions company, Illumina has taken the lead to organize other companies in market-wide efforts to ensure proper flow of genomics products through the value chain, to patients and physicians. FDA approval is a critical component to reach diagnostics markets. Illumina has tactically chosen to focus in areas where FDA approval can be more easily gained (e.g., due to strong patient need in oncology) or is not required (e.g., forensics). Therefore, Illumina has established a strong push into the oncology arena, where its gene panel products are used to diagnose and direct the medication of patients based upon each unique individual’s genetic profile. It has built strong relationships with its customers, not only to develop its products, but also to coordinate communication of its benefits to regulatory agencies and insurance companies. Reimbursement is a critical component in the value chain, as without it few patients could afford the benefits of genomics-based medicine. These efforts are starting to bear fruit. On November 23, 2015, Cigna became the first payer issuing new guidelines on the reimbursement of whole exome sequencing for clinical patients. Illumina diversifies its own value chain by investing in companies that will monetize NGS applications. For example, Illumina’s technology has supported the development of “personal genomics” products, such as 23andMe. These are genomics-based products that are not covered by insurance, but have varying costs, sometimes low enough to entice the average consumer to pay from his or her own pocket. This has created a myriad of companies offering genomics reports with slight to very significant clinical applications. Representing the lower-end, we find companies like 23andMe and Pathway Genomics providing average consumers with reports on ancestry; health risk and management; genetic disease carrier; and potential response to exercise, to diet, to certain drugs, etc. These reports, typically ordered through a physician, can be used to support general health management using a patient’s genomic information, to guide the selection among a few common drugs (to which he might respond better or have adverse reactions), or to gauge his response to very general types of diets (weight management) and overall body reaction to types of exercise. On the higher-end of the spectrum we find companies like Human Longevity, Inc. (HLI). This company offers a concierge medicine service that integrates medical records, genome, metabolome, biome, and body imaging information. HLI intends to establish correlations between health conditions and NGS information, which will identify a patient’s health risks and other specific health issues, enabling personalized medicine. Efforts such as these, using genetic information to inform health care decisions can be deemed proof of concept—to demonstrate health care cost savings compared to current standard of care through the use of genomic-based personalized and preventive medicine. Illumina has used its considerable weight to break ground for untapped or newly developed markets. In the area of oncology, Illumina spun off GRAIL, Inc., a company devoted to early cancer detection through blood-based screening, in January 2016. According to Illumina’s own estimation, the cancer diagnostics market is estimated to grow to over $13 billion by 2020. Through GRAIL, Illumina has created a new product category in the cancer diagnostics market, one poised to disrupt current standards of cancer care. Finally, Illumina has shown itself to be mindful of events and developments down its own value chain. The most telling example may be in non-invasive prenatal testing (NIPT). In this arena, NGS is used to determine autosomal abnormalities in the fetus with virtually no risk for the expectant mother. A few years ago, an intellectual property (IP) battle was brewing in the NIPT market that would have derailed its development. Illumina stepped in, buying the company Verinata Health, Inc., in January 2013 for $450 million. By pooling IP, Illumina quelled the disputes between Verinata and Sequenom, Inc., enabling cross-licensing and granting other concessions. In turn, this prepared the field for the rapid growth of the NIPT market. In turn, this prepared the field for the rapid growth of the NIPT market. This market has great potential, with around 4 million pregnancies each year and the possibility to grow from $560 million in 2014 to $1.5 billion by 2020. By intervening to disentangle its own value chain, Illumina promoted the smooth development of this particular diagnostic market. This version of the old quote from Seneca speaks to Illumina’s meteoric ascent. There is much to learn from what Illumina has done over the past decade and a half. There has been a grand vision, but for its realization there has been a carefully planned long-term strategy. Discipline was used in the actions employed to achieve this vision. Its approach does not seem to be driven by immediate gain, but by a carefully crafted long-term vision. Nonetheless, there has been flexibility to adapt and incorporate other businesses, as adjustments have been necessary. As in the case of a few other companies, the appearance of effortless success is deceiving, and absolutely merits careful study and understanding. Illumina’s push forward does not appear to be slowing. Though competitors continue to pursue innovation of their own, Illumina does not rest. Specifically, Illumina does not seem to focus on being a crowd-pleasing company, constantly looking at the price of its own stock or taking short-term actions to raise its price. Each of Illumina’s movements looks as if it is cautiously thought out and evaluated for the long term. Illumina does not rest at the top of its value chain; it acts as a restless enabler for those companies and entities downstream, helping those companies to produce the currency they need to spend in turn. Illumina has taken an active role in the development of the industry and markets that depend on the goods Illumina itself produces. It is clearly making a push to foster environments that will demand its products for a long time in the future. Francisco Uribe graduated from the Rady School of Management with an MBA in June 2016. He also holds a MS in Biochemistry and Molecular Biology from Universidad Católica de Chile and a PhD in Biochemistry and Molecular Biology from Michigan State University. Early in Francisco’s career as a research scientist, he fell in love with the potential of applied science to make the world a better place. Biotechnological, pharmaceutical and therapeutic applications are close to his heart. His ultimate desire is to see the fruits of scientific research successfully come out from the laboratory into the world. Francisco plans to use his knowledge and experience to contribute to the science-driven business community of San Diego. Image courtesy of Illumina, Inc.
 For more information on Illumina, see http://www.illumina.com/. R.M. Schneiderman, “Illumina Buys Solexa,” Forbes, November 13, 2006, accessed July 10, 2016, http://www.forbes.com/2006/11/13/illumina-pharmaceuticals-earnings-markets-equity-cx_rs_1113markets10.html. Daniel Macarthur, “Illumina launches personal genome sequencing service for $48,000,” Wired, June 11, 2009, accessed July 10, 2016, http://www.wired.com/2009/06/illumina-launches-personal-genome-sequencing-service-for-48000/. Illumina, Inc., “The $1000 Genome,” accessed July 10, 2016, http://www.illumina.com/content/dam/illumina-marketing/documents/company/featured-articles/the-1000-dollar-genome.pdf; E. C. Hayden, “Is the $1,000 genome for real?,” Nature, January 15, 2014, accessed July 10, 2016, http://www.nature.com/news/is-the-1-000-genome-for-real-1.14530; and Illumina, Inc., “Powering Population-Scale Human Whole-Genome Sequencing,” accessed July 10, 2016, http://www.illumina.com/systems/hiseq-x-sequencing-system/system.html. National Human Genome Research Institute, “The Human Genome Project Completion: Frequently Asked Questions,” last modified October 30, 2010, accessed July 10,, 2016, https://www.genome.gov/11006943/human-genome-project-completion-frequently-asked-questions/. Paul Murdock, “The 25 Fastest-Growing Tech Companies,” Forbes, January 26, 2007, accessed July 10, 2016, http://www.forbes.com/2007/01/25/fastest-growing-stocks-tech_cz_pmjr_0125fasttech_land.html. Paul Murdock, “The 25 Fastest-Growing Technology Companies in America,” Forbes, January 29, 2009, accessed July 10, 2016, http://www.forbes.com/2009/01/28/fast-tech-growth-technology-fasttech09_0129_intro.html. John Ray, “America’s 25 Fastest-Growing Tech Companies,” Forbes, February 16, 2011, accessed July 10, 2016, http://www.forbes.com/2011/02/16/apple-google-data-technology-fast-tech.html. Yahoo! Finance, “Illumina Inc. (ILMN) – NasdaqGS,” accessed July 10, 2016, http://finance.yahoo.com/q?s=ILMN. GenomeWeb staff reporter, “Roche Announces $5.7 Billion Hostile Takeover Bid for Illumina,” GenomeWeb, January 25, 2012, accessed July 10, 2016, https://www.genomeweb.com/sequencing/roche-announces-hostile-takeover-bid-illumina. Max Nisen, “How Illumina’s Gene Sequencing Technology Could Transform Health Care,” Business Insider, October 17, 2013, accessed July 10, 2016, http://www.businessinsider.com/illumina-genome-sequencing-growth-2013-10; and Catherine Wood, “Illumina Is the Bedrock of the Genomic Revolution,” ARK Investment Management LLC, April 21, 2016, accessed July 10, 2016, http://ark-invest.com/genomic-revolution/illumina. Antonio Regalado, “EmTech: Illumina Says 228,000 Human Genomes Will Be Sequenced This Year,” MIT Technology Review, September 24, 2014, accessed July 10, 2016, https://www.technologyreview.com/s/531091/emtech-illumina-says-228000-human-genomes-will-be-sequenced-this-year/. Illumina, Inc., “Management Team: Jay Flatley,” accessed July 10, 2016, http://www.illumina.com/company/about-us/management-team/jay-flatley.html. Mathew Herper, “Illumina CEO Jay Flatley Built The DNA Sequencing Market. Now He’s Stepping Down,” Forbes, March 7, 2016, accessed July 10, 2016, http://www.forbes.com/sites/matthewherper/2016/03/07/after-17-years-as-a-dna-sequencing-pioneer-illumina-ceo-jay-flatley-steps-do/#48e9a2153b67. GenomeWeb staff reporter, “Cigna Issues Coverage Criteria for Whole-Exome Sequencing; WGS Still Not Covered,” GenomeWeb, November 23, 2015, accessed July 10, 2016, https://www.genomeweb.com/sequencing-technology/cigna-issues-coverage-criteria-whole-exome-sequencing-wgs-still-not-covered. 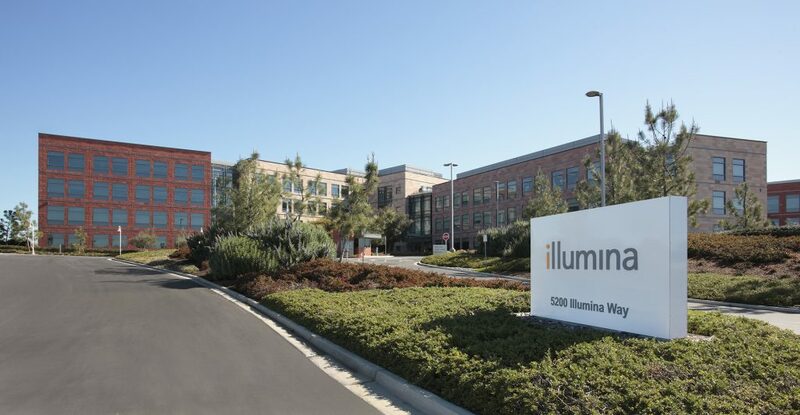 Illumina, Inc., “Illumina Forms New Company to Enable Early Cancer Detection via Blood-Based Screening,” Business Wire, January 10, 2016, accessed July 10, 2016, http://www.businesswire.com/news/home/20160110005039/en/Illumina-Forms-Company-Enable-Early-Cancer-Detection. Julia Karow, “Illumina Sees Diagnostics as Largest Growth Opportunity; Dx Strategy to Focus on Cancer,” GenomeWeb, June 20, 2012, accessed July 10, 2016, https://www.genomeweb.com/sequencing/illumina-sees-diagnostics-largest-growth-opportunity-dx-strategy-focus-cancer. Ashwin Agarwal and others, “Commercial Landscape of Noninvasive Prenatal Testing in the United States,” Prenatal Diagnosis 33, no. 6, (June 2013): 521–31, accessed July 20, 2016, http://onlinelibrary.wiley.com/doi/10.1002/pd.4101/full. GenomeWeb staff reporter, “Illumina Completes Verinata Acquisition,” GenomeWeb, February 22, 2013, accessed July 10, 2016, https://www.genomeweb.com/sequencing/illumina-completes-verinata-acquisition. GenomeWeb staff reporter, “Illumina, Sequenom Pool NIPT Patents, Settling IP Disputes,” GenomeWeb, December 3, 2014, accessed July 10, 2016, https://www.genomeweb.com/business-news/illumina-sequenom-pool-nipt-patents-settling-ip-disputes. Brady E. Hamilton, Joyce A. Martin, and Michelle J.K. Osterman, “Births: Preliminary Data for 2015,” National Center for Health Statistics, Centers for Disease control and Prevention, June 2016, accessed July 2016, http://www.cdc.gov/nchs/nvss/births.htm. P&S Market Research, “Global Non-Invasive Prenatal Testing (NIPT) Market (Size of $563 Million in 2014) to Witness 18% CAGR During 2015 – 2020,” November 2015, accessed July 2016, http://www.psmarketresearch.com/press-release/nipt-market.